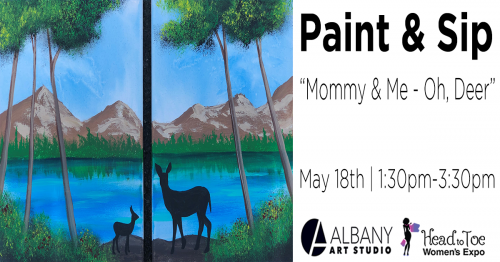 Head to Toe Women's Expo has partnered with Albany Art Studio to bring you this step by step "Mommy & Me - Oh, Deer" painting! $25 per adult. Ticket price includes: all supplies and 1 drink ticket. Non alcoholic drink options available. Space is limited to 30 people so book now! No art skills needed, so bring your kiddos for a fun Mommy & Me unique & memorable experience! No kids? No problem! You can do this painting on your own, with a spouse or with a friend! The "Mommy & Me - Oh, Deer" class is Saturday, May 18th from 1:30pm-3:30pm held at The Head to Toe Women's Expo. The Head to Toe Women's Expo is Saturday, May 18th at the Linn County Fairgrounds. The Head to Toe Women's Expo itself goes from 10am-6pm and is free admission. Details about the Expo can be found at: www.headtotoewomensexpo.org. *After your order has been processed you will be e-mailed an order confirmation and day of event details.